What are the different types of folding? - ColorFX Inc.
What are the different types of folding? Paper can be folded in countless ways. Understanding folding is essential, since mismeasured folds are often the perpetrators of many reprints. Folding is not a precise art. Generally, you can expect a tolerance of 1⁄32“ inch per fold. This depends on the weight and caliper of the paper stock and the placement of the folds. This impacts the way the job will finish; proper planning and making sample mockups in the design and production stage will help eliminate errors. 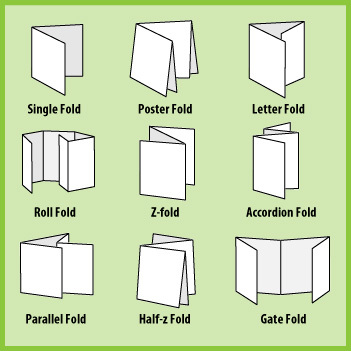 These are some of the most common folding styles used in print production today. Use of standard names will help ensure good communication between designer and printer. Next What is the best binding technique if I have critical crossovers?